I first started learning about proper black hair care in October of 2005 after reading the book, Ultra Black Hair Care Growth by Cathy Howse. That book started me on an eye-opening journey towards learning about why I could never grow my then ear-length and damaged hair past neck length. The first thing most Black women do wrong when it comes to taking care of their hair is that they do not moisturize often enough or use the right products to moisturize with. Black hair is naturally the driest kind of hair there is because the curl pattern makes it difficult for sebum to nourish the entire hair strand. Therefore, we must add extra moisture. The best moisturizers for black hair list water or glycerin as the first ingredient. For example, I personally use Nexxus Headress Weightless Leave-in Conditioner. In general, hair grease products that contain petroleum or mineral oil as the first ingredient should be avoided because they do not moisturize, but instead merely coat the hair strands and block the pores of the scalp, causing buildup and attracting dirt. The subject of dirt brings me to the next thing that black women are doing wrong when caring for their hair--they do not wash their hair often enough. A lot of black women I know (and I used to be one of them), will only wash their hair once a month because they believe the myth that water dries their hair out even more and that frequent washing causes damage. This isn't true. Water is the best moisturizer of all moisturizers, but when you simply let the hair dry without putting anything onto the hair to keep the moisture in, all the moisture evaporates into the air, leaving your hair even drier than it was before you washed it. You must add a moisturizer, followed by an oil (I use Olive Oil mostly, but there are hundreds of oils you can use!) before drying your hair to keep moisture in and avoid dryness. I wash my hair about once a week. Some black women wash their hair every day or every other day and it is long, healthy and strong. By the way, air drying is best for black hair because of the third and final topic I will discuss. Excessive heat is another huge reason black women have damaged hair. 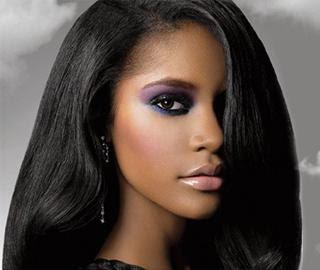 Blow dryers, curling irons, flat irons and hot combs make the dryness in our hair worse and causes breakage and damage. The less heat and manipulation you put your hair through, the better it will look! There are many alternatives to using heat on your hair like rollers, wrapping, and air drying. By following these and other Black hair care techniques, my hair is now almost arm pit length--the longest (and healthiest) it has ever been in my life!